An aldol reaction gets its name from the 2 functional groups that make it up. Let's take a look at how we can distinguish this condensation from others. In this video, I wanna focus in on a specific type of condensation reaction called an aldol condensation. From prior videos, we know that an enolate is a negatively charged species and it can attack electrophiles. But what we didn’t really realize up until this point is that these enolates can actually react with themselves. They can react with themselves to condensate specifically if it’s a ketone or aldehyde, it’s going to condensate into this category of molecule called a beta-hydroxycarbonyl. The final products are called aldols, that's the reason that we have that name because they’re part aldehyde and they’re part alcohol. Hence the name aldol. What I’m going to do here is I’m going to show you the full mechanism for an aldol condensation. One of the most important things to realize about any condensation reaction is that a big part of getting these questions right isn’t just knowing the mechanism. It’s knowing how to line up your carbonyls because if you line them up incorrectly, you’re going to be doing a lot more work and you’re probably going to get it wrong. I’m going to teach you not only just the mechanism but I’m going to use my years of teaching experience to try to ingrain this method into you of how's the best way to line up your carbonyls so that you can always visualize the product the easiest. The first step is super easy. All it is is that using some kind of base, usually OH negative, to pull off a proton and make your enolate. Remember that enolates have two different resonance structures. There's also a resonance structure with the negative on the O, but we're not going to use that one. For this mechanism, you always wanna be using the enolate on the carbon because that's going to help predict what our product looks like. The reason that we would get an aldol condensation is when you have a base, but you have no other electrophile. You might be wondering, “How would I know that something is an aldol?’ And how would I know that something is, let’s say a reaction from another chapter because there’s a lot of reagents that you know now. But if you are forming an enolate without an electrophile to react with, then you know this is going to be a self-condensation which is exactly what we're going to draw. So, we've got our enolate. Notice that my enolate, I’m drawing it on the left hand side. I’m always going to draw the enolate on the left. I don't have an electrophile on the right. I don’t have a halide or an acyl chloride or whatever. That means I’m forced to react with just another carbonyl. How does that work? I like to call them there’s the enolate, and there’s the electrophile. Why? The enolate is the one with the negative charge. The electrophile is the one that you’re going to attack the partial positive of. This one should not be in an enolate form. You should just draw this the normal way that it was before the these reacted. A few other pointers here, you want to make sure that your enolate is drawn on the left but that your anion is toward the electrophile because you want to have the electrophile and the anion as close to each other. Here, I’m drawing the enolate on the left but I wanna make sure my negative charge is as close to the electrophile as possible. Also, any R groups on it: face downwards. This is going to come up more later. But if I had bulky R groups on that CH2, I should actually face them facing down to clear the way for the electrophile that I’m about to attack. My electrophile, we’ve actually got some special rules about that one. The electrophile, you draw on the right, always on the right. You should draw your smallest group toward anion. The reason is because we're going to have to attack with the anion and it’s going to be easiest to visualize if I have my small group close to the anion and my large group away from it. I think that’s enough to get going. This mechanism is going to look like as follows. This a nucleophilic addition mechanism. My negative charge is going to attack my partial positive. I’m going to break a bond. I'm going to make a tetrahedral intermediate. It’s a big tetrahedral intermediate, I understand. But you still have an O negative with now what groups? Now you’ve got the extra CH2 that’s attached here. We still have that H. the H that was here, it’s still here. It's just I'm not drawing it, and then there's the CH3. This is called a nucleophilic addition mechanism because we're going to protonate the O at the end. We're not going to kick out a leaving group. We use water or acid to protonate and to give us our beta-hydroxycarbonyl because I have a beta-hydroxy on my carbonyl. The reason I call it carbonyl is because it could be either a ketone or an aldehyde. It’s just depending on what you started with. That’s really it. It's a really easy mechanism. It’s nucleophilic addition, putting two molecules together. One thing that I always encourage my students to do is to count up your carbons at the end because the carbons in your product should match the carbons of your original enolate times two. My original enolate had how many carbons? Two. So, I have two carbons here. I’m going to put two C. I'm adding another two C. That means that my beta-hydroxycarbonyl should have, if I did it right, it should have four C. Does it? Let's count. Yeah, we did it right. You'd be surprised how many stupid mistakes are made because you miss a carbon or you add an extra carbon. Guess what? Professors are not forgiving on that kind of stuff. You can make a lot of mistakes but you can miss carbons because that's just a completely different molecule. It turns out that beta-hydroxycarbonyls are a little bit more complex. It doesn’t just end there because beta-hydroxycarbonyls are much easier to dehydrate than a typical alcohol. Remember, this concept comes from Organic Chemistry 1 alcohols underwent dehydration reactions. Remember that in a dehydration, I’d take away a water and I get a double bond. Usually, you need heat to do that or you need a lot of very good strong acid. Usually it would be an acid-catalyzed dehydration. I know what I’m talking about so I’m going to write it here. Usually this would be an acid-catalyzed dehydration in order to do this. But it turns out that this alcohol, this specific beta-hydroxy is not going to require a strong acid to dehydrate. In fact, it's not even going to require heat. Why? Because look at the product. After you dehydrate, the dehydration product is uniquely stable. Why? Because it’s conjugated. Due to conjugation, this double bond is much more stable than a normal double bond. What that means is that it's not going to take much for that alcohol to leave. In fact, it can leave both in acidic environments and in a basic environment. In an acidic environment, it’s going to leave via an E1 mechanism. If you guys remember, that’s a carbocation mechanism where you wind up forming a carbocation and doing a beta elimination. In a basic environment, you can’t get a carbocation. You would actually react by another mechanism that we’re not even going into in this course called E1CB or E1 Conjugate Base. The point here isn't for you to draw all these mechanisms. That's not my goal right now. What I want you to know is that many times because this dehydration is so favored, we're going to assume that the condensation product dehydrated on its own without even requiring an explanation. Sometimes you’re going to see your professor just write the product as a double bond, as a dehydration product and you're not going to ask questions. You’re not going to say, “Professor, why did it dehydrate?” These are going to spontaneously dehydrate because the product is so stable. We do need to know what this product is called. It is in general a dehydration product but specifically it has two names. One, and most commonly it’s called an alpha,beta-unsaturated that's because now we have an unsaturated bond between our alpha and beta carbons. Alpha,beta-unsaturated, keep that in mind. Another really important name for it is an enone. An enone just makes sense. It’s a combination of alkene and one. That would either come from the ketone or the aldehyde. It’s still a carbonyl. That’s where we get the word enone from. Both of them are interchangeable. They just mean that it’s the dehydration product of an aldol condensation. Many times, for example when I'm drawing my products for all of my practice problems, I’m always just going to be taking it to the enone. I'm going to be assuming dehydration and for your sake, if you're watching these videos and you're wondering, “What should I do? Should I dehydrate?” I would always dehydrate unless your professor says not to because like I said, it's so favored that it's just going to happen without a lot of stimulus. Awesome, guys. That's it for this video. Let's move on to the next one. Practice: What product can be isolated from the following aldol condensation reaction? Practice: Provide the mechanism for the following transformation. Draw the structures of the dehydration products expected if the aldol reactions below are exposed to strong acidic conditions. Give the structure of the hydroxyaldehyde product of the aldol condensation (at 5°C) of 2-phenylacetaldehyde. 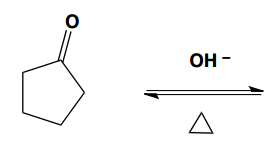 Which of the following statements describes the first step in the mechanism of the aldol condensation? a An α hydrogen is abstracted by the base to form an enolate anion. b A nucleophilic base attacks the carbonyl carbon atom. c The carbonyl oxygen is protonated by the base ion. d The α hydrogen is abstracted by an acid to the enolate anion. e The carbonyl oxygen of one aldehyde attacks the carbonyl carbon of another. Propose a synthesis of the compound shown, from the starting material(s) specified and any other needed reagents or solvents. Which compound is the product of an aldol condensation? An aldol reaction can produce an addition product or the dehydrated addition product (condensation product). What factor favors the formation of the dehydration product? Which is not true of the aldol reaction? A) It accomplishes the formation of a new carbon-carbon bond. B) The key step in the mechanism is attack of the α-carbon atom of an enolate ion on a carbonyl carbon atom. C) Dehydration of the aldol product is often observed (an aldol condensation). D) The enolate is favored at equilibrium. Which of these is not a step in the mechanism of the aldol reaction? Which of these compounds cannot undergo an aldol reaction in the presence of dilute base? The first two steps in the base-catalyzed condensation of acetaldehyde would be described as A) attack of –OH on the carbonyl carbon atom, then loss of water. B) attack of –OH on the carbonyl carbon atom, then the resultant anion attacks the carbonyl atom on a second molecule of acetaldehyde. C) –OH abstracts an α-hydrogen, then the resultant anion attacks the carbonyl carbon atom on a second molecule acetaldehyde. D) –OH abstracts the hydrogen atom from the carbonyl atom, then the resultant anion attacks the carbonyl carbon atom on a second molecule of acetaldehyde. Provide the missing reagents and draw the mechanism to complete this transformation. Give the structure of the alpha,beta-unsaturated aldehyde product of the aldol condensation of propanal. Give the structure of the alpha,beta-unsaturated aldehyde product of the aldol condensation of butanal. Predict the major organic product(s) for the following reaction. If more than one product is formed label the major product. Theoretically, what is the maximum number of b-hydroxy aldehyde stereoisomers that could be formed in the self-aldol reaction of propanaldehyde? Show them. Show all stereoisomeric b-hydroxyaldehyde that could from the self-aldol condensation of isobutylaldehyde. When 2-butanone is heated in the presence of aqueous sodium hydroxide, two constitutionally isomeric condensation products are obtained. Draw both products. Give the major product for the following condensation reaction. Predict the major product for the following reaction.